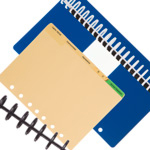 Aerobind offers custom sized QRH paper stock to make it easy to print your own manuals. You can replace pages or print revisions for your 7, 10, 11, 12, 13, or 22 ring pilot checklists. We offer any custom size in different weights so you can have any size and page thickness you need. You can also print a brand new checklist from scratch with replacement QRH paper from Aerobind. We provide paper from the same printers that handle OEM aircraft manuals so that they will fit any size you use. Print your own QRH with pilot checklist paper stock from Aerobind. Aerobind already offers the finest binding supplies for your pilot checklists. Now you can print an entire QRH complete with paper, hole punches, divider tabs, and binders. We’ve eliminated the need to search for multiple suppliers to print your own pilot checklist or QRH. We also get our aircraft manual paper from the same printers that supply OEM manuals, so your new checklist will look and feel as professional as the one you are revising or replacing. In addition, we offer any custom size and multiple weights of QRH paper stock. You can use our paper for pilot checklist applications of any kind. Our pilot checklist paper is not pre-drilled in order to prevent printer jamming. 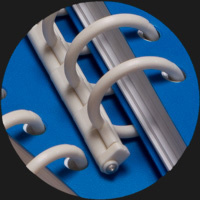 We recommend an Aerobind paper punch to punch your replacement QRH pages after you print. We believe you deserve high quality aviation checklist products at a lower price. Our paper for pilot checklists is designed to fit any size aircraft manual you use. Since many of our products are already original equipment for OEM aircraft, you can trust Aerobind products for their quality and compatibility. See our related products below or click here to see more.